One of the highlights of my November trip to Italy was a lunchtime visit Giovanni and I made to the home of Maria Teresa Mascarello in the village of Barolo. That’s the gardiniera (above) her cousin made her. 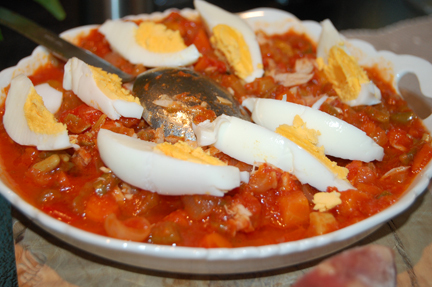 It was topped with hard-boiled egg wedges and crumbled olive oil-cured tuna. The combination of textures was wonderful, one of the best things I ate on this trip. 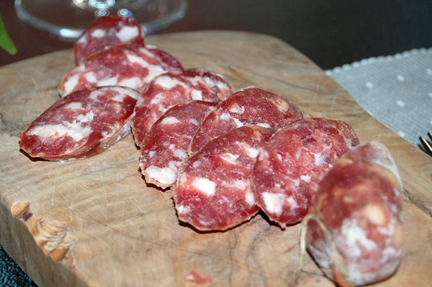 The butcher who makes this cacciatora is di sinistra, noted Maria Teresa, on the left side of the political aisle. And that was one of the reasons it was so tasty. In the U.S., we rarely discuss the ideology of people whose food we eat. In many homes in Italy, such gastronomic scrutiny is de rigueur. 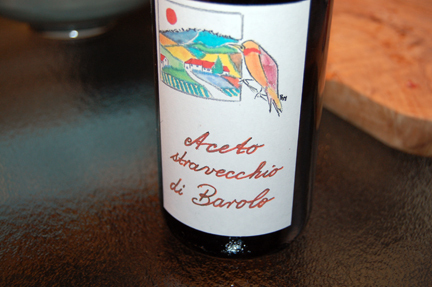 Of course, Bartolo Mascarello aged vinegar was offered to guests to dress their lettuces. Conversation was dominated by the center-left primary elections (which would take place the following day). Maria Teresa was one of the polling organizers. But it soon turned to the sticky subject of Natural wine. Maria Teresa expressed her frustration with the Natural wine movement, noting that she doesn’t consider her wine a Natural wine by any means. The obsession with “zero sulfur,” she lamented, was misguided. 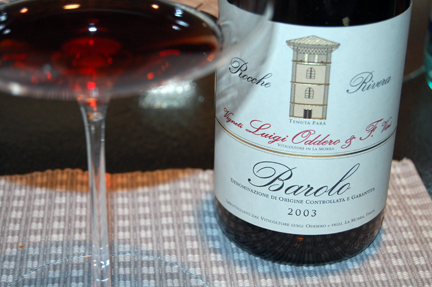 Maria Teresa’s partner David was geeked for us to taste a Barolo — the Luigi Oddero Rocche Rivera — that he’s keen on. Traditional in style, this wine showed uncommon balance for a 2003. Its earth and tar prevailed over its fruit but its acidity delivered unexpected brilliance in the mouth. Gorgeous wine. Conversation also touched upon the recent and ongoing Cannubi controversy. Political discussion and cultural engagement at the dinner table are considered a responsibility in the homes of many Italians. In the Mascarello home, of course, the di sinistra ideological legacy of Maria Teresa’s father Bartolo still resides warmly. 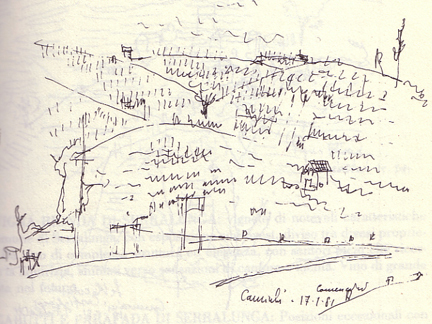 Above: A drawing of “La collina dei Cannubi” (“Cannubi Hill”) by Eugenio Comenicini, 1981 (reproduced from Martinelli’s monograph Il Barolo come lo sento io, 1993). As Marta Rinaldi — daughter of Giuseppe Rinaldi, one of the eleven wineries who contested the redesgination — reported in this moving post on Intravino, it took a court order to stop the Marchesi di Barolo, whose motive to remap appellation subzones is rooted in desire to exploit the most recognizable crus of Barolo for financial gain. Cannubi is considered by many to be one of Barolo’s greatest vineyards and one of its most historically significant growing sites. This fact, coupled with foreigners’ ease in pronouncing the toponym (kahn-NOO-bee), have made it one of the most popular (and lucrative) vineyard designations in the appellation. 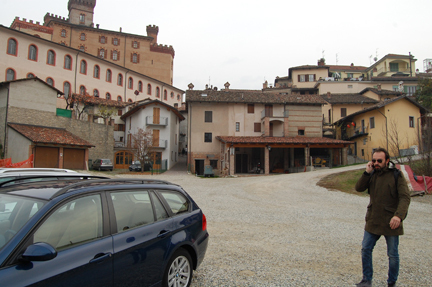 Above: Giovanni and I drove from Brescia to Barolo on Saturday morning. In October of this year, the Marchesi di Barolo filed an appeal with the court to lift the injunction against them. And its outcome is uncertain. “On the ground” in Barolo, there is even greater concern regarding the vineyard’s future because the Ceretto and Damilano wineries recently partnered with James Suckling to make a documentary about Cannubi (it was shot during harvest this year). And the movie is to be incorporated, Maria Teresa told me, in a marketing campaign to promote the sale of wines labeled “Cannubi” in the ever growing Asian market, where the thirst for high-end wines seems to know no bounds. As an owner in Cannubi and one of its most well known producers, Maria Teresa was approached by marketers to participate in the program. “A campaign like this shouldn’t move forward until the question has been resolved,” she told me. “I’m not going to partner with my quote-unquote enemy… the Marchesi di Barolo in a promotion like this,” noting that the Marchesi di Barolo is planning to be part of the campaign. 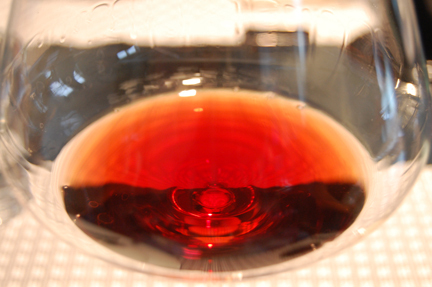 Above: Will the color of traditional Barolo be sullied by the green of avarice? It’s not clear when the court will rule on the Marchesi di Barolo’s appeal and the stakes are extremely high. I’ll be following along closely and will report news as it arrives from Langa. In the meantime, a Google image search for “Cannubi” will deliver a number of photos and maps of this historic vineyard if you’re interested in learning more.